The first funeral was in Guildford on Monday January 4th the first working day back for many people after an extended Christmas Break. Being Self Employed, the best Christmas present anyone can be given is a job as soon after the New Year as possible. However, trying to get information from Florists, Funeral Directors and Crematoriums is not easy at this time when a thing called Christmas provides a huge distraction. Rather than fight through the major traffic congestion that was envisaged for the Monday morning, David elected to travel to Guildford on the Sunday but finding undercover storage for the 1950 Leyland Beaver wouldn’t be easy with most locations still closed after the Christmas Holidays. Luckily the Daughter of the Deceased lived on a farm and she kindly arranged for space to be cleared in their workshop and this location proved to be the most atmospheric setting the 1950 Leyland Beaver has parked in. The Deceased had been a Mechanic who had worked on vehicles like David’s at the start of his career, however, after retirement the last third of his life was dedicated to his garden. So rather than having a Floral Tribute made from flowers his Daughter arranged for a an exquisite display of vegetables to be created which would be placed in front of Gardening Tools, a Fork, a Spade and a Wheel-Barrow. Bed & Breakfast accommodation wasn’t easy to find in this rural area, however, a local farmer took in guests at his Manor House in a way to diversify away from his traditional income on a Dairy Farm which had sold its Jersey Herd a long time ago. It was certainly a grand setting, however, there was no chip shop at the end of the street so David changed his normal mode of operation, keeping his sandwiches for his tea and having a hot meal at lunch time in the Bull Inn at Bentley on the A31. Part of the instructions from the Family was that David should not wear black but a grey shirt and pullover was requested by the Daughter of the Deceased. However, when David was collecting the vehicle in the morning the Deceased’s Son-in-Law, a colourful character, took a dim view of David’s dress code and presented him with a red jumper. David explained that had he known that a more colourful outfit was required he would have provided one. David went on explain that on two previous occasions he has been asked to impersonate the late Fred Dibnah and the Son-in-Law then asked David to become Fred Dibnah for the next hour explaining, ‘You even look like the old (Expletive) in those thick 1950 style spectacles.’ David is pictured below in his Fred Dibnah guise, however, David believes he is only poor representation of the great man who was a renowned Steeple Jack in the 1960’s . At Guildford Crematorium as David was releasing the ratchet straps off the coffin, the Son-in-Law shouted in a loud voice, ‘Ladies & Gentlemen I give you Mr. Fred Dibhah.’ David didn’t disappoint telling the Bearer on the opposite side of the deck, ‘Nay then, tek this strap in thy hand and tek it t’ back of lorry.’ Climbing onto the deck David said, ‘Reet then, I’ll turn t’old lad and get im riddy t’ come off side roller.’ The mourners started to clap to show their appreciation of David’s efforts. The second funeral was in Swanley on January 26th and this was for a former Lorry Driver who also been a Royal Marine in WWII. The Floral Tributes were a ‘DAD’ and a ‘Pillow’ and David suggested to the Son of the Deceased that he would position ‘DAD’ on the Headboard and the ‘Pillow’ would sit on a step in front of the coffin. In order to exceed the expectations of the Family, David customised the ‘step’ to appear like the back end of a Lorry. The location that David used for many years to park the Leyland Beaver under cover the night before an Orpington funeral is now longer suitable so it was time for a new start. In recent times David has approached Tyre Fitting Companies because normally they don’t store vehicles inside their location overnight, unlike Commercial Garages with ATS and Kwik Fit being used in a number of occasions. David approaches the Manager, explains that he needs to put his lorry undercover the night before a funeral and a reward of a box of biscuits usually gets the Manager to agree. However, the Manager at Kwik Fit Orpington was initially reluctant to make a decision and said he would be more comfortable if David approached the Head Office and got them to sanction that the Leyland Beaver could be parked undercover within his facility. David was concerned as the involvement of someone from Head Office may put a stop to him approaching Managers directly and in the limited time before a funeral the last thing David needed was to spend an hour on the phone trying to find the appropriate person. 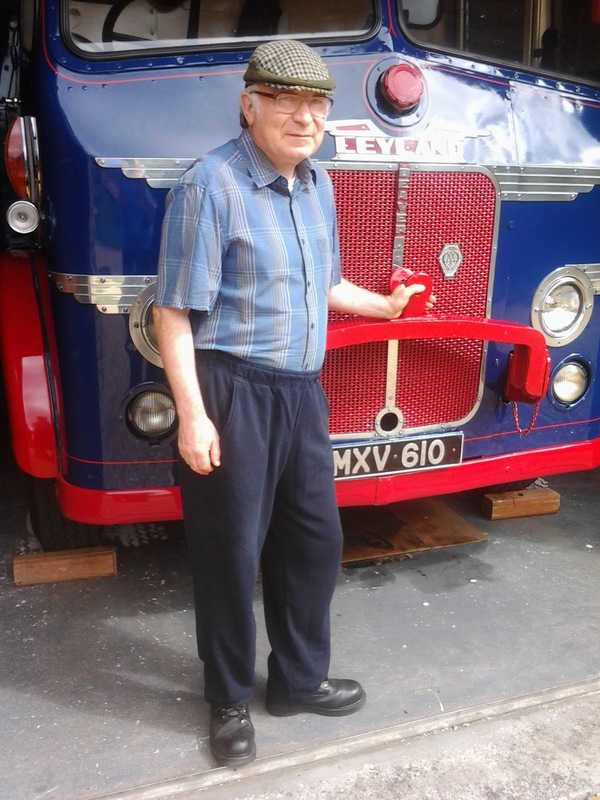 David made three attempts to find someone who could help him and fortuitously he spoke to a young lady who listened intently and promised to look at the Vintage Lorry Funerals web site before speaking to her boss. David told her that many years ago he had written to Tom Farmer, then Kwik Fit owner, about a possibility to undertake a Distribution Quotation and he got a polite reply personally signed by the great man. David thought that he had done all that he could but reckoned that there was only a slim chance that a big company would be prepared to help him. Later that afternoon whilst David was working on the deck, his wife called him back into the house because an email had arrived from Kwik Fit which stated he could park at any Kwik Fit site in Britain provided the lorry was covered under its own insurance and that the Manager was happy that it would fit. The Orpington Manager was now relaxed and he offered David use of his fridge to put his sandwiches in there overnight and some hot water to wash the lorry if required. David had difficulty speaking with the Florist who was a friend of a distant Family member and it wasn’t until the day before he was scheduled to leave did he manage to speak with her and it was just as well he did. In addition to the ‘DAD’ and the ‘Pillow’ there was a 21 inch ‘Heart’ from the Sister of the Deceased so David quickly assembled a suitable stand which would position this important Floral Tribute near the head of the coffin. The key part of the support structure was a triangular shaped piece of wood which had already made a number of appearances already to support a ‘Butterfly’ in Snodland, a ‘Cat’ in Newbury and in Hungerford, a ‘Car’ in Horfield Bristol and used to depict a ‘Plane Wing’ in Gosport. Cost effective B&B accommodation was available within walking distance, however, the place had no eating facilities which may have caused a problem. However, within 100 yards of the B&B was a Retail Park, so it was Nandos Chicken Burger for supper and Costa Coffee Bacon Sandwich for breakfast. One of the Kwik Fit lads offered to come in early to get the Leyland Beaver on the road by 0745 hours, however, it still took an hour to travel the short distance to Swanley. When the Son of the Deceased saw the flowers in place he thanked David for all his efforts and he asked if he could travel in the cab with David. This was a win, win, situation because it meant so much to the Son of the Deceased and he told David all about his Dad and this made the creation of an Obituary Article so much easier. On his way back from Eltham Crematorium David elected not to use the South Circular, which is renowned for heavy traffic and long queues but he took the A224 and the A232 on which the traffic seems to flow. Within four hours driving The Leyland Beaver glided from Eltham, through Croydon, along the A31 and into Sutton Scotney Services on the A34 where David took his 45 minutes statutory rest break. David then let the rush hour traffic to subside and he got home at 2000 hours at the end of a 13 hours day.